If you don’t experience ANY improvements within four days of taking Prevent.Pro (as described below), we would refund the full price of the product. We guarantee that you would feel an improvement. And we guarantee a full refund. 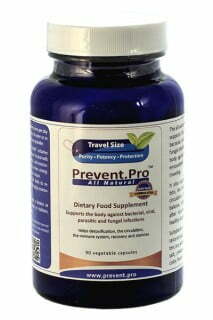 If you enjoy the benefits of Prevent.Pro, please, share it among your friends. We want to keep the price low and we can do that by advertising less. Thank you for the opportunity to help you – and for your help. I developed a cold and I purposefully didn’t do anything for three days just to test Prevent.Pro. By the third day my sinus was full, I had a headache and I couldn’t sleep through the night without blowing my nose (don’t ask me about the color…). I was ready for testing the Prevent.Pro. On the fourth day I took my first Prevent.Pro capsule with 2000 mg (2 grams) vitamin C and took them every second hours until I went to bed in the evening. My headache was gone by the evening and my stuffy nose let the air through. The color became more natural when I blew my nose, indicating that the bugs got some serious beatings there. Such a relief in one day! I had to wake up only once to blow my nose – a good improvement. I kept the same routine on the next day and by the evening I felt almost normal. I still had a bit of runny nose but I could sleep through the night. At this point, I switched over to the two times three capsules routine (and kept taking with it twice daily 2000mg vitamin C). And send your experience to support@oradix.com. This entry was posted in Health News and tagged anti-biofilm, antifungal drugs, ear infection, flu, sinusitis.